Thanks to Stuart Gandy for making this Radio WM photo card of Ed Doolan available. 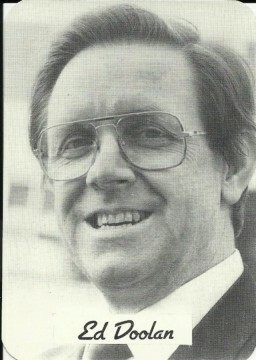 Ed Doolan was born in Sydney, Australia, and spent ten years working as a school teacher, before taking up broadcasting, originally in German. He started with Radio WM at BBC Pebble Mill in 1982, and began his consumer show in 1988. He was awarded an MBE in 1998, and was the first person to be awarded Honorary Degrees by Birmingham City University, University of Birmingham and Aston University!